Jay found this late ’70s Sanyo at a consignment shop up in Maine for $15. Price was right, this thing looks like it was barely used! 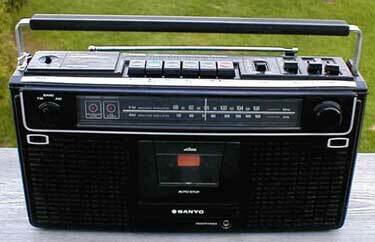 Simple, no-frills model from Sanyo, but unlike today’s Sanyo, this component is actually well-made and built to last. I have this same model in good condition and the cassette door is silver, not black. I think this unit had the door replaced. Is this the original door? If so, there were 2 versions. Nice!